In this Post we have discuss one more topic related to PHPMailer Class and here we have discuss how can we send an Email with File attachment in PHP by using PHPMailer Library. We have received so many request from our viewer for publish web tutorial on sending of Email with Attachment by using PHPMailer from PHP form submission. We have already publish web tutorial on how to send email on PHP form submission and how can we send bulk email by using PHP with Ajax without refresh of web page. But in this post we have discuss something advance like how to send email with attach uploaded file by using PHPMailer Library in PHP. PHPMailer is a PHP Class library which are used for sending email and this class has more functionality compared to the simple PHP mail() function including file attachment also. It is very useful if you have SMTP details then you can use that details into your PHP script and from your application you can send an email and you can also attach file with email on form submission by using this PHPMailer class. For discuss how can we attach file sending of email by using PHPMailer in PHP. So here we have make simple programmer registration form in which programmer can fill their details. In that registration form we have add one file tag for programmer to attach resume. In this form all fields are compulsory and for form validation we have use HTML 5 validation. By using this validation we do not want to required to write any additional code for form validation. For attach file in an Email, so want to first upload file on our server folder and from that uploaded file path we can attach within mail by using AddAttachment() method of PHPMailer class. After attachment of file we can send email with file attachment using PHPMailer library. After successfully sending of email we have remove uploaded file from our space. So this way for attach file with email sending we want to temporary store on our space and after remove from our space. 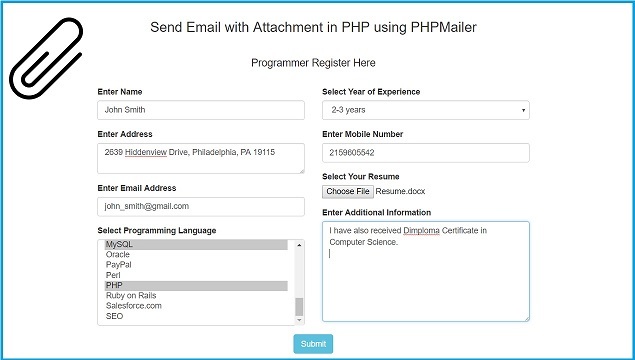 This is our simple tutorial on How to send email with attachment in PHP by using PHPMailer. $mail->SMTPSecure = '';       //Sets connection prefix. Options are "", "ssl" or "tls"
Have you considered adding some form input validations. It will make this very advanced. Otherwise great work. hi i am getting there is an error msg. how do i fix it.